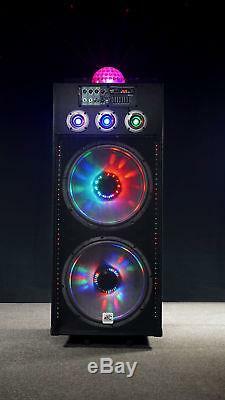 NYC Acoustics N215B Dual 15 800 Watt Powered DJ Party Speaker with Bluetooth, Lights, and Microphone. Condition: BRAND NEW IN ORIGINAL PACKAGING. Dual 15 Powered Bluetooth Speaker. The NYC Acoustics N215B is one of the coolest speakers on the market. It really gets the party going. This speaker, first and foremost, was manufactured to give you crystal clear sound. With 800 watts peak power and 400 watts RMS power this is actually one of the most powerful speakers at this price point. One thing some audio enthusiasts overlook is the level of importance the enclosure of the speaker has on sound quality. This uses a top of the line wooden enclosure which is one of the reasons the sound quality is so crisp. Other brands use particle board wood which is not as dense as the high quality MDF wood we use. This item has (2) 15" woofers with 2" KSV voice coil and 40 Oz magnets that provides really CLEAN sounding bass. The 3 tweeters provide great sounding highs. One of the reasons our speaker sounds so good is due to the amplifier. A speaker can only go as loud as the amplifier powering it. We invested into the proper enclosure, proper amplifier, and then matched the proper speaker components with the enclosure and amp. The built in graphic EQ will allow you to customize the sound to match your favorite music genre. With the included wired microphone you can sing along and do karaoke or make speeches or just make a fool of yourself at your next party which is what I like to do in my spare time. This speaker is incredibly portable. It has a built in trolley handle and wheels making it very easy to transport from party to party. On the front panel you will notice easy access to a 7 band equalizer, a USB and SD input. There is a ¼" mic input, and a ¼" line input, as well as an RCA aux input to plug in any music player. Each input has independent volume controls. The last thing we really want to make a point to mention again is the quality. Our purchaser traveled and audited many factories in China who make these types of LED powered speakers Most were not as good as we wanted them to be. So after months and months our engineers had a prototype in our office. We basically upgraded the enclosure, upgraded the amplifier, and made some other changes to make these the best on the market. NYC Acoustics N215B dual 15 3-Way 800 Watt Active Speaker with built-in Bluetooth, MP3 display, USB, SD. 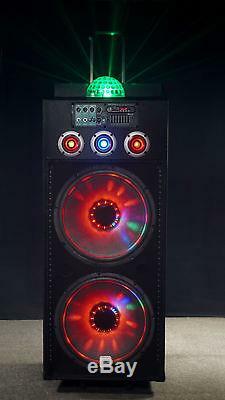 Perfect for house party's, home use, Light DJ setups, and other many other applications. 800 Watts Peak / 400 Watts RMS Rated with true world power ratings; don't be fooled by brands who write 3,000 watt on cheap speakers. These go way louder than those! (2) High power long-throw 15'' woofers with 2 KSV voice coil. (3) Piezo tweeters built in. ¼ line input with level control. RCA Aux Input with level control. Built-in wheels and retractable trolley handle for increased portability and transport convenience Provides incredibly deep bass and acoustic power. 7 band graphic equalizer built in. Magic ball on top transmits a disco dance light effect in the room. 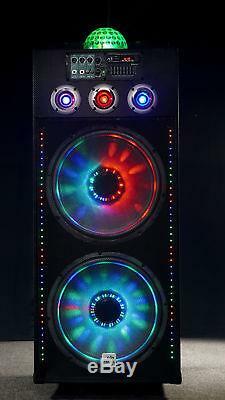 LED flashing lights on woofer. LED screen displays audio information when using Bluetooth or SD/USB player. Linear class AB amplifier technology: high power, transparent sonic performance. Internal switch-mode power supply for low distortion audio with superior transient response. Boosting and cutting specific frequencies to improve sound quality and clarity. High-quality components and exceptionally rugged high impact wooden construction. Amplifier clip limit LED indicator & power LED cabinet rear. 110/220-volt switchable power supply with external user serviceable fusing. Speaker dimensions in inches : WxDxH 16.93" x 13.26" x 48.03. Packaged dimensions in inches : WxDxH 18.51" x 15.62" x51.10. 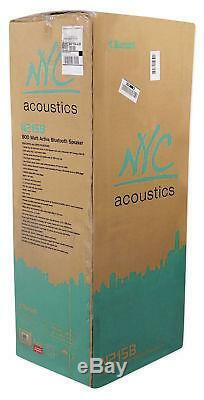 Best prices - We sell all NYC Acoustics Products at great prices. Lifetime Customer Service by NYC Acoustics product experts. Guaranteed legitimate and authentic merchandise. If your item is defective or you want to return it for any reason within the first 30 days of when it was delivered to you; you have the following options. We will send you a. To replace the item for a brand new one. All replacements and exchanges are free. This includes blown speakers with burned voice coils. The item "NYC Acoustics N215B Dual 15 800w Powered DJ Party Speaker Bluetooth, Lights+Mic" is in sale since Friday, December 15, 2017. 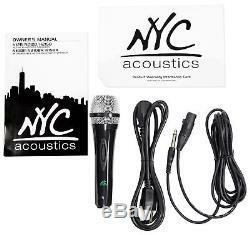 This item is in the category "Musical Instruments & Gear\Pro Audio Equipment\Speakers & Monitors". The seller is "audiosavings" and is located in Inwood, New York. This item can be shipped to United States, Canada, United Kingdom, Denmark, Romania, Slovakia, Bulgaria, Czech republic, Finland, Hungary, Latvia, Lithuania, Malta, Estonia, Australia, Greece, Portugal, Cyprus, Slovenia, Japan, China, Sweden, South Korea, Indonesia, Taiwan, South africa, Thailand, Belgium, France, Hong Kong, Ireland, Netherlands, Poland, Spain, Italy, Germany, Austria, Israel, Mexico, New Zealand, Philippines, Singapore, Switzerland, Norway, Croatia, Brazil, Chile, Colombia, Saudi arabia, Ukraine, United arab emirates, Qatar, Kuwait, Bahrain, Malaysia, Costa rica, Dominican republic, Panama, Trinidad and tobago, Guatemala, El salvador, Honduras, Jamaica.